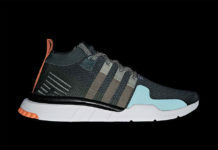 adidas Originals will be introducing several new releases from their adidas EQT lineup. Two of the paris that will be debuting are these adidas EQT ADV Primeknit colorways for the month of August. One pair comes dressed in a “Triple White” color scheme, while the other sports a sleek Black and White option. Both are constructed with a Primeknit upper, sock-like ankle collar, ribbon side panels as the Three Stripes sitting atop a rubber outsole. Check out the detailed photos below and look for these adidas Originals EQT ADV Primeknit releases to become available sometime in August at select retailers.